Spending a hard day on a lake and returning with empty hands is sheer disappointing. Fishfinder is your best bet to avoid this disappointment. A good fishfinder increases your chances of enjoying your fishing expedition in a true sense. From basic to very elaborate, there are countless fishfinder brands on the market. Here are tips to help you find the best fishfinders for 2016. Fishfinder manufacturers normally include various features in their products so as to meet the various needs of different fishermen. While choosing the best product for you, you should first consider your fishing style. Two of the major factors to consider are Transducer and Display. The transducer is the part of the fishfinder that is often in the shape of a cone and sends down a sound wave. You can imagine an ice cream cone attached with its pointed end to transducer and the open end into the water. Narrow Beam: A narrow beam normally has an angle of around 20°. Thus if you are in 20 feet water, it would make a circle of around 7 feet across on the bottom. Wide Beam: There is a wide beam too (generally around 60° angle) which would make a circle of 22 feet across on the bottom. You can get information from your fishfinder only of object that are within this cone. So, the wider the beam, the more area is covered and the more fish can be identified. But there is a shortcoming of the wider beam; it loses its strength much sooner. Due to this, it cannot pierce in the water unlike its narrow sibling. The narrow beam on the other hand can pierce into the water to more of depth and can give more details of the structure of bottom (rock, weed, mud, etc) even in shallower waters. Dual Beam: A good solution to this is the dual beam (aka dual frequency) that has a combination of features of both into one transducer. Specialized Beam: Specialized beams sometimes feature multiple (4 or more) beams that cover a huge area and can form 3D images on the display. Side beams are also available that actually project their beam to the sides and increase the search area. While considering display of your fishfinder, pixels are of huge importance. The more pixels it has, the more detailed information you will get. And also the more pixels, the higher the price of the equipment. A pixel is the smallest part on the display screen. A low-priced model may have a display of 160V x 132H i.e. 160 pixels vertically and 132 horizontally. An expensive fishfinder on the other hand may feature 640V x 320H that would squeeze around 10 times more pixels on the screen and thereby give you much better resolution. Color also has its cost. A color display is more expensive. The standard color display will be costlier and have fewer pixels than an equivalent black-and-white model. But rather than 12 levels of grey, every pixel can have up to 256 choices for colors. The maximum usable depth of fishfinder is determined by its power. Thus a 100 watts power can achieve a depth of 600 feet, whereas a 500 watts power can go up to 1500 feet of depth. Higher power models are needed in saltwater fishing as salt water takes up more energy. You can also get portable fishfinder which is fully self-contained. It is available in its own carrying case with battery for power supply. GPS (Global Positioning System) receives information from satellites and uses it to work out your exact position. Satellite TV charges a subscription fee, whereas GPS radio signal is free. GPS has now become an essential fishing item. 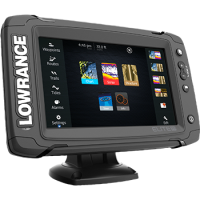 It’s very convenient to have one unit of your console featuring both a fishfinder and a GPS and is a real space-saver and economical. Fishfinders.info is the best website to get reviews of various fishfinders on the market. By reading the comprehensive fishfinder reviews here, you can make a more informed decision.